Use Black Friday Early Bird Sale to engage your customers by turning your campaign into a game. To do this, you’re going to use filters, personalized emails, and different discount codes. The workflow is triggered when your contacts click on a link in the message explaining the rules of the early bird sale game. Then, contacts go through a filter dividing them into three groups, based on how quickly they took action. Immediately after, contacts in each group get an email with a discount code. After 12 hours, the system checks if anyone converts. If they don’t, each group gets an additional retargeting email to remind them of the offer they’re about to miss out on. 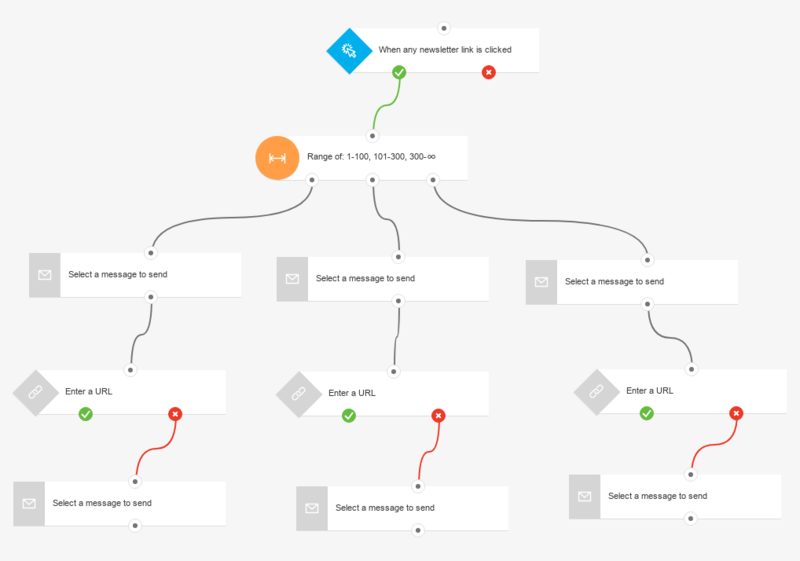 You’ll need automation messages or messages (or drafts) that can be used as one to publish this workflow. 1. For the Link clicked condition, decide if you want to keep the default general settings or use the drop-downs to narrow down the condition to a specific message and link. 2. For the Range filter, enter the ranges based on how large you want to keep the groups. Your ranges might look like this: 1-100, 101-300, 301- 500. 3. For each of the Send message actions, select the message you want each of the groups to receive. The wait time for the condition should be set to 12 hours. After this time, customers who don’t complete their purchase will go down the negative path and receive a retargeting email. 5. For each of the Send message elements, select the retargeting message to send.